This might be a sort of obvious statement for me, along the lines of, “Oxygen is really wonderful stuff,” or “Since I have to eat every day, I’m really happy someone invented food” But, I do feel like it needs saying every once in a while. I love all sorts of artists for the color and life they bring to the world, the unexpected juxtapositions of imagery and meaning, the metaphors and the details. The melancholy mood of Billie Holiday’s “Foolish Things”, or the violent wind that seems to shake Van Gogh’s White Roses, or William Butler Yeat’s “rough beast” that brings in a nightmare in “The Second Coming”: all are wonderful and terribly beautiful and full of imaginative life. I am transported by a vision or a feeling that I would have never arrived at without the compulsive need of an artist to create. It is amazing. But, I also love artists for entirely selfish and narcissistic reasons. I love when I can see myself, my life, or what is important to me in the art around me. I love that this unknown photographer abandoned stuffy parlor portraits to capture this mother. I think that one of my friends finally softened into trusting me after see the same look on my face as the mother in this photograph has. For the first few weeks I knew my friend, she saw only my furrowed brow and heard only my scolding towards my children. Eventually I let my face soften into the same face in the picture, and I could feel her soften, too. Across a century I see myself. I love that these animators chose to draw George and the Man with the Yellow Hat this way. 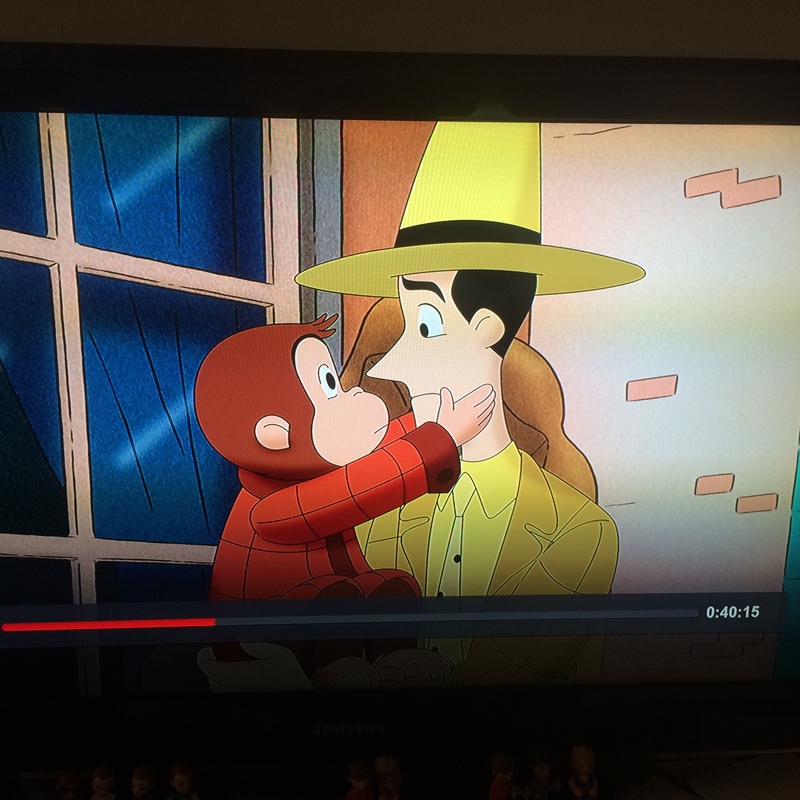 This comes from a longer episode of Curious George about Halloween. In this still, George has just been told that a frightening legend may have some truth to it. He grabs the Man’s face and stares hard into his eyes. My oldest child’s birthday is towards the end of October, and whenever we go to the party store to find decorations for his celebrations we are bombarded by macabre costumes and props: knives and skeletons and blood and gore. My youngest could not bring himself to walk through this store, so I always carried him. When a motion detector would trip ghoulish noises, he would grab the sides of my face in his chubby tiny hands and straighten my head so that I could only stare into his eyes. I could not determine if he was trying to protect me from the scary things all around us, or if he needed steady, unwavering reassurance from me. How amazing that that gesture is universal enough that it made its way into this animation. 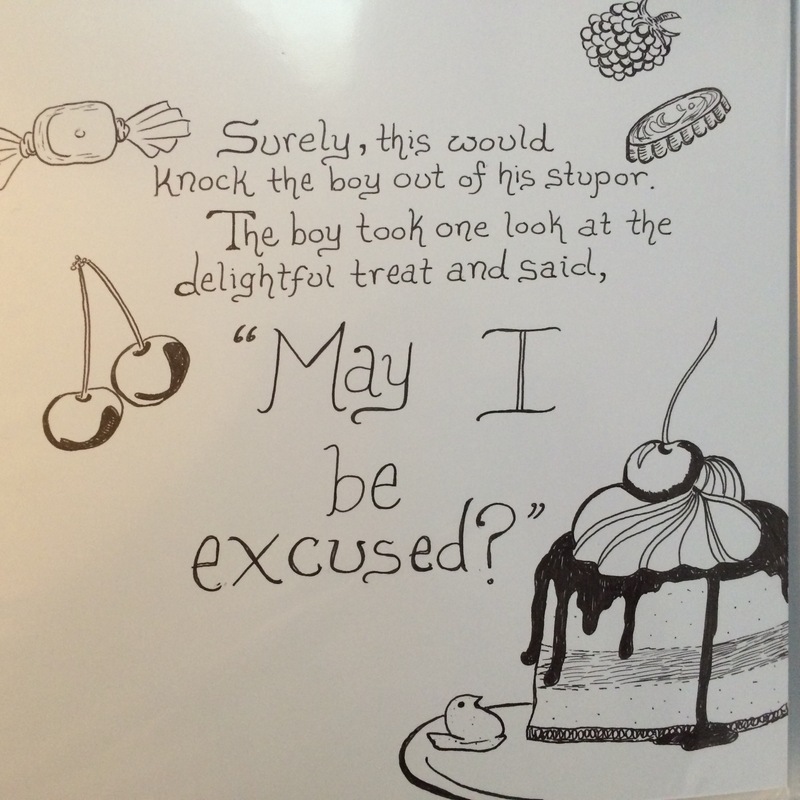 My youngest son recently got a book for his birthday, a book he loves and which contains a page that describes the protagonist child’s favorite dessert. On a plate, next to an elaborate and beautiful cake, is a small Peep chick. As soon as he caught it he yelped out loud and pointed at it and laughed and laughed. A Peep! Look right there! I love Peeps! 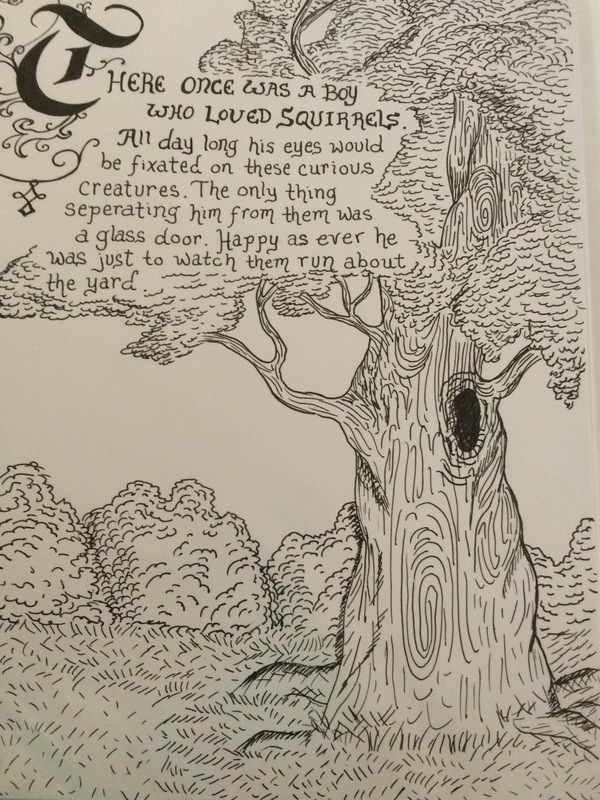 He recognized himself in the pages of this book, and it made him fill with delight. Someone else who loves Peeps as much as he does, this character. I’m not sure if I should tell him that this particular book was inspired by him in the first place. 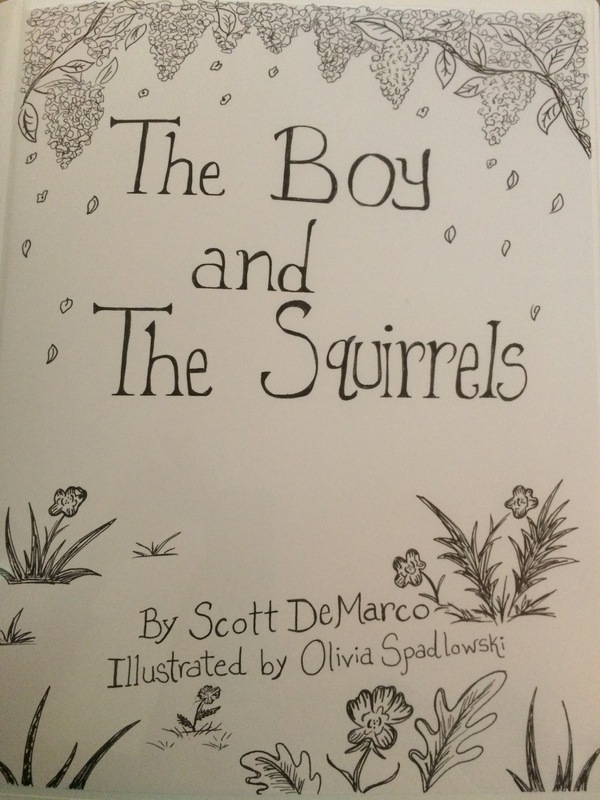 My brother wrote it and my future sister-in-law illustrated it with him and his love of squirrels in mind. So the Peep was intended as a nod to him from the beginning, and when they saw him see it for the first time, they both lit up. Seeing yourself in art never gets old. To see a piece of what you know and have lived reflected back to you, to see something that felt important to you lovingly captured in photos or drawings or poems or songs, it is a kind of magic. The kind of magic that makes you feel less alone and less apart from the rest of the world.